Happy Hump Day! 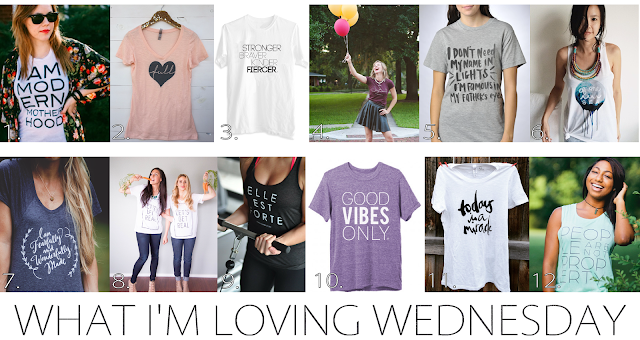 I am so excited to announce the first installment of "What I'm Loving Wednesday" a weekly post that will list some things from the past week that I am loving, can't live without, on my wish-list, or are things I am plain obsessed with - and I will even add links (when applicable) so you can check out or scoop up anything you love too! What I'm Loving Wednesday will be a great way for me to showcase some of my favorite products, tell about something fun that happened, show you what I'm crushing on, highlight some of my favorite blogs and instagram feeds and a great way for you to find all kinds of great new products to buy or people to follow! I am so excited about What I'm Loving Wednesday and it is going to be a BLAST! I hope you will follow along! Today is all about... Ladies tees and tanks! All from small and fair trade shops, some from mom[preneur] owned shops and some that a portion of the proceeds go to charity! Enjoy! The perfect shirt for all of us modern mothers... We are re-defining motherhood as most know it and we're pretty amazing. Plus this shirt is breastfeeding friendly, #amazing. High fives all around. What makes your heart full? For me... Jesus, my husband, my daughter, my step-daughters, family, friends, food, photography, etc.... I love this shirt! Whatever it may be, this is the perfect tee to show the world that your heart is indeed full. Stronger, Braver, Kinder, Fiercer. I feel all of those things since becoming a mother. Motherhood has made me a better person and I am so thankful. Do you have joy in your every day? I am always on the search for joy, to spot it even in the days when things aren't going planned. A joybound journey. Plus, a portion of proceeds go to charity! This song speaks so deeply to my heart and what's better than wearing a tee with the lyrics of one of your favorite songs? A reminder that the number of followers doesn't really matter, what matters is that He knows your name. He knew your name before your were conceived. A unity inspired surf brand [you all know how obsessed I am with the ocean] I love this brand and this shirt. Sometimes it does take a village [or ocean? ], and we should always have each others backs. Always be reminded of your true beauty and worth while wearing this tee. Such a beautiful tee with a beautiful message to remind you that you are beautiful, inside and out. We all strive to make our lives look completely perfect, right? Perfect looking instagram feeds and blogs. But we are all just real people, imperfect people with imperfect lives, why hide it? By putting on this shirt, you must take on the responsibility to be your bona-fide (real; genuine) self! I LOVE this! Elle est forte is French for "She is Strong" derived from Proverbs 31:25 "She is clothed with strength and dignity, and she laughs without fear of the future"... While wearing this tank we can always be reminded that we can laugh without fear of the future since God is on our side! These tees celebrate the fact that "today IS a miracle"... Because it is! Whether you are healthy or living with cystinosis, cancer, etc. etc. etc.. Every single day is a miracle. Plus $5 from every tee will go to the Cystinosis Research Network! Simply put: people are not property. This statement tee is a great way to promote conversation about modern day slavery happening around the world [and unfortunately even in the US] and what we can do to help bring it to an end.